Four thousand state employees, from teachers and broadcasters to municipal police officers and janitors, face dismissal by December in the first official cull of Greece’s overstaffed civil service in more than six decades. After missing a June 30 deadline set by international lenders, the governing coalition must this week push legislation through parliament enabling the sackings or risk losing a critical €6.8bn tranche of bailout aid. The vote in parliament takes place on Wednesday. Resistance to a reform that deals a blow to Greece’s clientelistic political system remains strong, however. On Monday more than 200 mayors across the country shut down municipal services, including rubbish collection, to protest against the sackings. Public sector unions called a one-day nationwide general strike for Tuesday and a march to parliament. 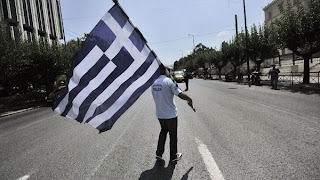 The measure has angered lawmakers in both the centre-right New Democracy and Panhellenic Socialist Movement (Pasok), the coalition partners, many of whom rely on “rousfetia” – carrying out political favours – for their constituents to win re-election. Yet some state employees recognise the game is up. Twenty-four-year-old Paris, who declined to give his second name, says he expects to be among the first to be fired. A high-school dropout, he joined the Athens municipal police thanks to a family connection with a former mayor.